Try a simple and effective mindful eating exercise to kick-start more intentional, mindful eating habits that will help you lose weight. In Part 1 of this two-part series, you learned how being distracted when you eat can lead to overeating and unhealthy habits, which may make losing weight particularly difficult. Here, you’ll learn about a simple mindful eating exercise will bring your focus and awareness back to your food. Weight loss doesn’t have to be nearly as difficult or complicated at it seems. Whether you need to lose weight to improve your health or just want to look better by summer, follow the five simple steps to get healthy without feeling frustrated or deprived. Find a time that you’re hungry, and choose a small snack—a piece of fruit, a handful of nuts, or something else healthy. Sit down to a table, void of distracting stimuli and in a calm environment, with your cell phone, computer, and TV turned off. Next, observe your snack closely. Look at the shape, color, and texture. Put it under your nose and take a deep breath to explore its smell. Take a very small bite. Hold the food in your mouth, taking in all the flavors and textures. As you begin to chew, notice how it tastes and feels between your teeth and on your tongue. Continue in this way, eating very slowly and taking note of all the thoughts, feelings, and sensations that you experience as you eat your snack. After you’re done, be aware of how your body feels. Are you full? Did you find pleasure in the snack? This simple activity can help to bring your awareness back to what you put in your mouth. It may serve as a wake up call, reminding you that food is more than just something you scarf down every few hours to stay full. Bringing your attention back to food and the process of eating can help you to develop healthy eating habits. Try taking the same principles used in the exercise above and apply them to your daily eating habits. Sit down to a meal as often as possible. Chew each bite, and really taste your food. Notice the flavors, smells, and textures. Appreciate how the food makes your body feel. And finally, be aware of how much food, and what kind, makes you feel your best. What thoughts and feelings do I have about my upcoming meal? Do I feel excited? Guilty? What does my body feel like before eating? Do I have any specific cravings? Do I remember what I just ate? What does my body feel like after my meal? Am I satisfied, still hungry, or feeling too full? Did my body react negatively to any of the foods I ate? Did I attach any guilt to my meal, or did I find pleasure in my food? Your goal is to become more aware of what you eat, and to become more attentive to your eating process and how your body reacts. You should consciously taste every meal and be fully aware of what and how much you’re eating. Noticing how you feel before, during, and after eating will help you gauge when you’re full, thus helping you to avoid overeating. 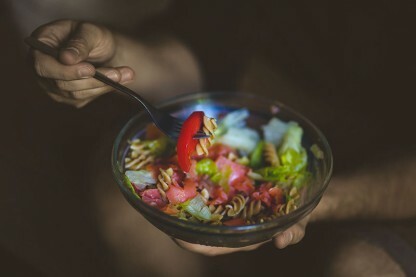 In general, a mindful eating exercise routine should help you to develop a more positive, healthier relationship with food. 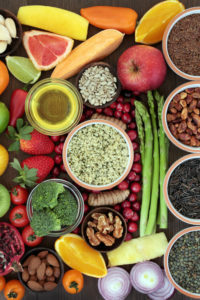 The strategies above will likely make eating smaller portions a more natural habit, helping you to stay healthy, shed some pounds, and more fully enjoy your meals in the process. Have you tried any mindful eating exercises? What did you learn from the process? How do you incorporate mindful eating into your daily life? Share your experience in the comments section below. appetite, appetite suppressant, benefits of cooking, benefits of cooking at home, cooking, eating habits, exercise, exercise routine, food, get healthy, health, healthy eating, healthy eating habits, how to lose weight, how to lose weight naturally, how to start eating healthy, Lose Weight, losing weight, mindful eating, mindful eating exercise, mindfulness, natural appetite suppressant, nuts, overeating, portion control, stay healthy, to lose weight naturally, what is mindfulness. UHN Staff, thanks so much for the post.Really thank you! Keep writing.